Sometimes the best ideas come from places of desperation or disaster. That’s the case with goTenna, a smartphone accessory that lets you use your phone to communicate even when a disaster knocks out cell towers. The idea was inspired when, in October of 2012, Hurricane Sandy wiped out cellular communications in New York and New Jersey. Daniela Perdomo was affected by the storm and subsequent loss of communication, and she knew there had to be something she could do to make sure the lines of communication remained open in any disaster – or anytime cellular communication isn’t available. 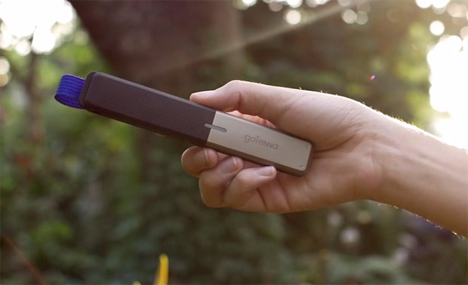 The goTenna is a pocket-sized antenna that uses VHF radio waves to communicate with other goTenna users. It works with an Android or iPhone app; in the event that cell phone communications are lost (or when you just can’t get a signal) you send a text message via the app, which is transmitted to the goTenna device via Bluetooth. The little accessory converts the message to analog, then transmits it to a specific goTenna user or a group of users. The little antenna can be used to send your current location to friends, which is an especially useful feature when you happen to wander off of the trail on a hike or get lost in the crowd at a music festival. Although the idea for the goTenna grew from an emergency situation, it can be useful in so many more settings. It’s a lifesaver for connecting people any time that our more conventional modern methods aren’t available. 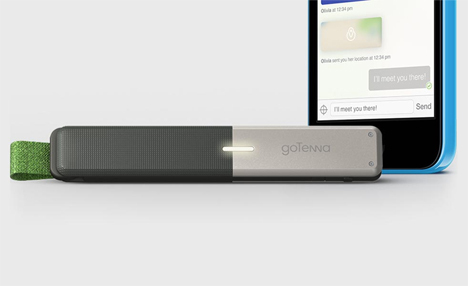 Though undeniably useful in certain situations, the goTenna won’t exactly revolutionize communications. It’s relatively short-range with a maximum reach of 50 miles, so it’s really only useful when you need to reach someone who is already kind of nearby. The goTenna is sold in pairs, one of which will run you $150. Go in on a whole bunch of them with a group of friends and you’ll always be assured of having a support system when things get rough.